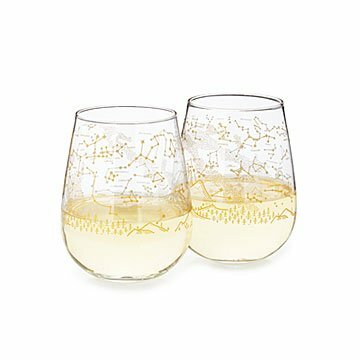 Bring the wonder of the night sky to your barware with this set of glasses covered with golden constellations. Your favorite bottle uncorked under a canopy of stars...it's enough to make even the most no-nonsense wine lover hopelessly romantic. Bring the wonder of the night sky's display to your barware with this set of glasses covered with golden diagrams of the constellations. Choose from Northern or Southern hemisphere sets— in each, the constellations as they appear in summer or winter skies hover above playful landscapes. The metallic decoration catches the light to add celestial sparkle to any occasion. Paired with their favorite varietal, they make stellar housewarming, hostess, or bridesmaids gifts. Designed in Portland, Oregon. Made in China. We love these glasses. The golden night sky print depicts both land, sea, terrain and charted constellations. There is a domed observatory, lighthouse, mountain range, cottage, and ship featured below the star-filled sky on each glass. I chose the Northern Hemisphere design with summer and winter constallations depicted and labeled. The glass is of medium weight..not really thick until the base, it is not at all flimsy, and the glassware shape is both masculine and elegant. These are a lovely way to chart the stars while dining and entertaining outdoors. Theses make a very cool addition to your barware collection! !